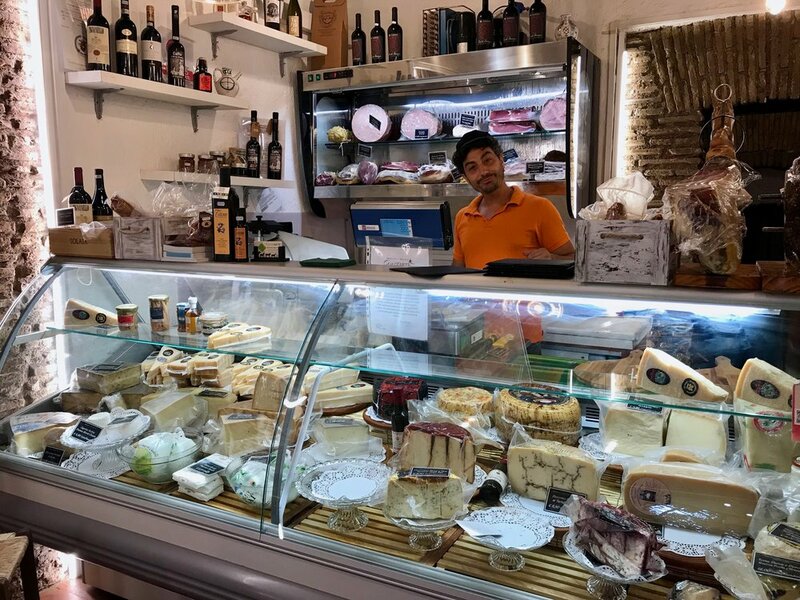 Recently I had the opportunity to go on my FIRST food tour in Rome with The Roman Guy, where we tried a number of Roman classics at different restaurants and shops in the center. This was such a fun experience and a tour that prioritizes food is one I can totally get behind. For anyone who’s curious about what a small group food tour in Rome is like, or looking for activities to do on a trip here, I’ll be sharing the logistics of the tour, a brief overview of the stops along the way and who I think this tour might fit best. Booking a tour with the Roman Guy is exceptionally easy. On their website they give a thorough breakdown of all the tours they offer (I’m dying to try the new Testaccio Market tour too!) and costs. All communication took place by email and they sent a prompt confirmation email with info about where to meet and what to bring (empty stomachs! comfortable shoes!). The Trastevere Foodie Tour was a group tour led by a fabulous Italian guide, Valeria. We ended up having 5 people on the tour (including me), so there was no difficulty hearing our guide talk or getting lost in the crowd. The max number of people they allow on the tour is 10. We met at 5:30 p.m. near Campo de’ Fiori, did a couple stops there, then crossed the river over to Trastevere to finish up the remaining 4 stops by around 9 p.m.
To give an overview of this food tour, without going TOO in depth, I’m sharing some notes about each of the stops we made along the way. The entire group all arrived on time (go American culture!) and found our tour guide waiting for us. After brief introductions and checking for food allegeries/intolerances, we were off to the first stop. 5:45 Nibble on regional meats and cheeses at a speciality shop. Here we were offered glasses of wine, small bites of mozzarella and pecorino cheese, prosciutto and salame. Our guide spoke about the differences between meats and cheeses from the different regions of Italy, paying special attention to the classics of the Lazio and Campagna areas. She described this as an “aperitivo” or Italian happy hour, which prepares your stomach for dinner. While this version was very light, some aperitivos can be quite heavy and buffet style, completely replacing dinner. A subcategory of Roman food that many tourists seem to miss are the fritti. This fried food usually eaten as a snack or before pizza can be anything from supplì (fried rice balls) fiori di zucca (fried zucchini flowers) or baccalà (fried salt cod). These foods have been around forever and you can find them at pizzerias and restaurants around the city. Filetti di Baccalà only has fried fish on their menu and it was served piping hot, with a light batter and super moist fish, alongside a big carafe of white wine. 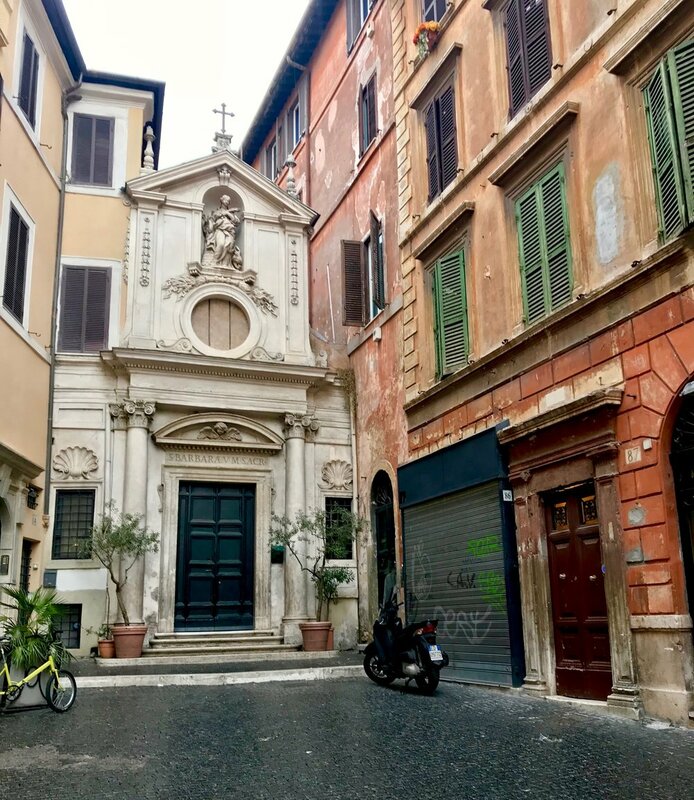 Our guide took the time to describe the origins of this classic Roman ‘hood, which was originally the home of the minority Christian population during Ancient Roman times. Ponte Sisto gives incredible views over the Tiber River and St. Peter’s Dome, especially in the pre-sunset light. 6:45 Stop in Piazza Trilussa, admire the crowds of people drinking and lounging on the piazza stairs and grab a slice. At a classic pizza al taglio location, we tried some pizza margherita by the slice, a typical Roman snack and one of the few things that are “acceptable” to eat on the go in Italy. At this point, we were all feeling very full and wondering how we could possibly fit in another aperitivo spot and then dinner. Km Zero’s name perfectly describes the location’s goals and atmosphere. It’s set up to look like a casual food market, showcasing local produce that’s sourced from farms around Rome. We had yet more wine here, and a variety of bruschette with vegetable spreads. My favorite was the interesting combination of swiss chard and ginger. For the full dinner portion of the tour, the entire group sits at a table and has dinner, family style. Compared to the much more casual locations and settings at the previous stops, our experience at Casa Mia Trastevere was more elevated, with antipasti served first (more fritti) and a choice of red or white wine. We tried two OG Roman pastas, an Amatriciana and Cacio e Pepe. The Amatriciana is cooked in a tomato base, with guanciale and pecorino cheese, while the Cacio e Pepe is exactly as its name describes: cheesy, peppery goodness. Unfortunately, I could only manage to eat some of the pasta because at this point I was already so, so full. The final stop of the night was obviously gelato, from the famous Gelateria del Teatro. This gelateria uses only local, fresh ingredients when making its gelato and you can seriously taste the difference. 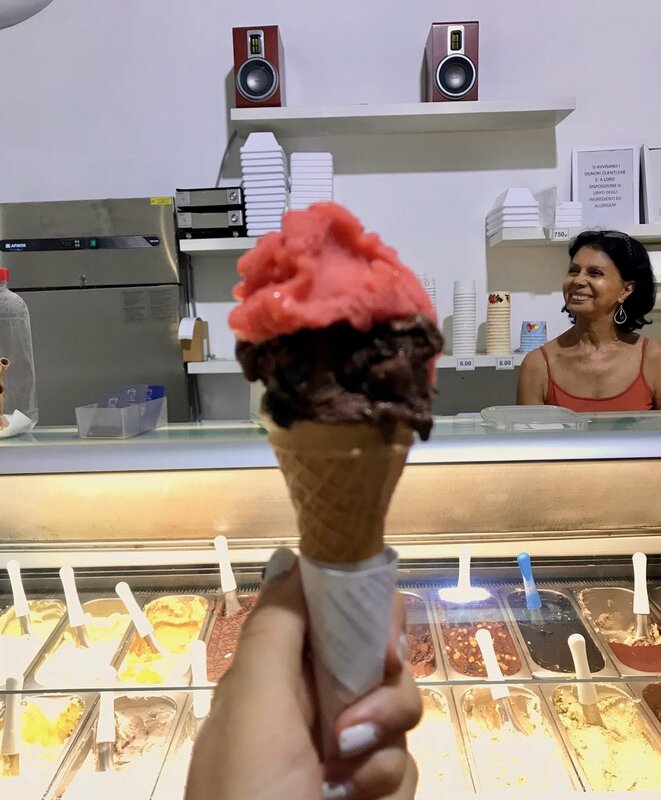 Our guide described how you can differentiate between great and “bad” gelato (see my gelato guide here) which is super helpful when you’re faced with so many options in the same city! I went with a classic strawberry and chocolate truffle combo in a cone, made more special by the fact that the strawberries were harvested from farms around Rome. 9.00 Enjoy your gelato and the fact that you just spent your entire night eating some of the best food of your life. A question that I ask myself before deciding to do any type of tour, whether it’s for the city center, a museum or food-based, is whether or not the experience merits paying a professional. When the tour is comprehensive and shows me a side to the experience I wouldn’t have seen without the help of a guide, I consider it well worth the investment. 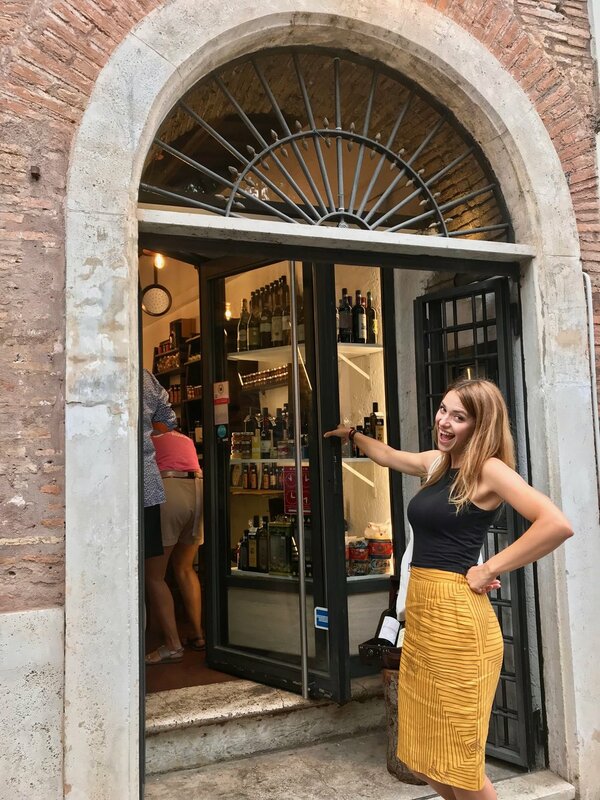 While I think this style of tour is easily replicated (by bar/restaurant hopping on your own), my favorite party of the Trastevere Foodie Tour were the stories behind each stop along the way. One thing I loved was hearing our guide, Valeria, discuss the regional differences in Italian food, what makes Roman food unique and the backstories behind the classics that we were eating. I would’ve loved to have heard more directly from the shop and restaurant owners about their backgrounds, something that might be possible in future tours if they speak English or if the guide could help translating. Ultimately, this tour was less about the individual parts and more about the experience as a whole. We had a great group of people who were interested and open to trying new things, which made the night truly a pleasure. Filling 3.5 hours with food, wine and laughter would make a great addition to any trip to Rome, and you get the bonus of trying several MUST HAVE Roman dishes like Cacio e Pepe, Amatriciana and baccalà fritto. I think this tour is perfect for any food-lovers coming to Rome for the first time, anyone looking to expand their knowledge of Roman food a bit, or for those who like the social aspect of doing a tour in a new country (looking at you solo travelers). 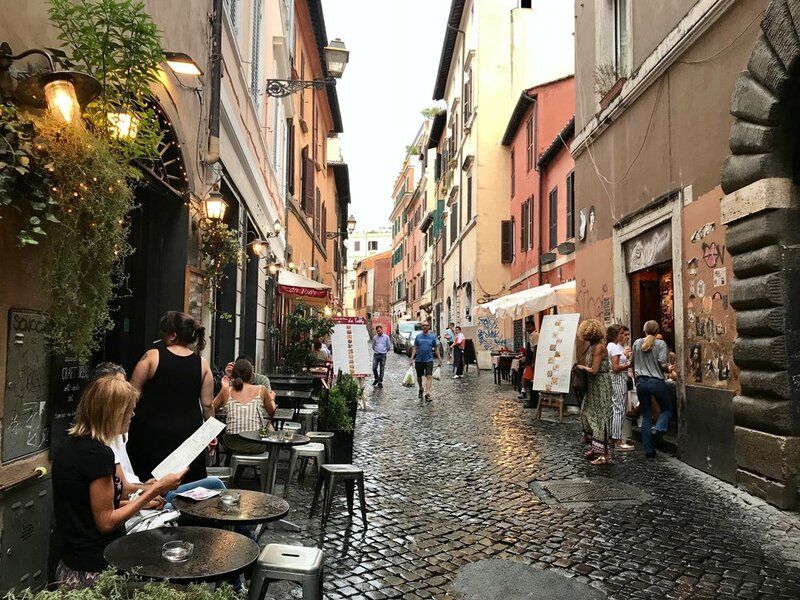 You’re able to meet people in a very casual setting and also learn more about Rome by spending time in one of its most beautiful neighborhoods. Another plus to this tour is it can easily be adapted to vegetarians, or people intolerant to gluten or dairy (just let them know beforehand so the team can make necessary arrangements). For people who want a more intensive “tasting” experience or a wider variety of gourmet dishes, I think a private cooking lesson or vineyard wine tasting experience would be more fitting. The Trastevere Foodie Tour is available for adults at €89, with private transportation to the meeting point starting at €55. This includes all of the snacks along the way, multiple glasses of wine and the time of your knowledgable tour guide. You can book your tour online here. I attended The Roman Guy’s Trastevere Food Tour as a guest of the company. 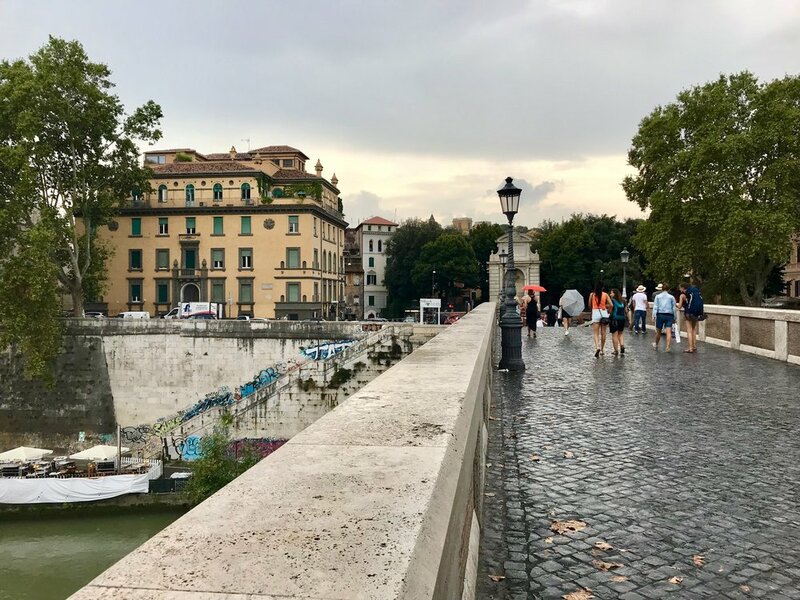 This didn't affect my review of the experience in any way and allows me to try more activities in Rome and provide more options for my readers!